Total traffic deaths have declined nationwide in recent years, but the same has not held true for the most vulnerable people on the streets: cyclists and pedestrians. In 2011, 130 more pedestrians were killed in traffic than the year before, a 3 percent increase, while 54 more people lost their lives while biking, an increase of 8 percent. The same year, overall traffic deaths declined 2 percent. As for the reasons why, good data has been scarce, but that hasn’t stopped major media from blaming victims for “drunk walking” or “distracted walking.” Now a new study published in Public Health Reports, the journal of the U.S. Public Health Service and the Office of the U.S. Surgeon General, reveals that distracted driving — particularly driving while texting — partially explains the rising death toll. A research team from the University of Nebraska Medical Center examined crash records from every fatal collision tracked by the Fatality Analysis Reporting System between 2005 and 2010. They found that the rate of bike and pedestrian fatalities in which distracted driving was listed as a factor increased sharply over that time period. Pedestrian deaths attributable to distracted driving rose from 344 in 2005 to 500 in 2010, significantly faster than overall population growth. Annual bicyclist deaths caused by distracted driving rose from 56 to 73 over the same period. Together pedestrians and bicyclists accounted for about one in 10 traffic fatalities that resulted from distracted driving, researchers found. Distracted driving was defined to include anything from tending to a child to tuning the radio or eating while driving. Cell phone use was a major culprit, cited by police in 18.6 percent of the distracted driving deaths involving pedestrians and cyclists. This is what happens when people focus more on the safety of the occupants in the car (the ones usually at fault in distracted driving) than outside. All lives are equal, but car manufacturers, the government, the media — they all focus on the safety of occupants in the car rather than the people who are hit outside of them. So then we see media and govt campaigns telling people walking to just look up and not have your head in the phone. Ridiculous. Everyone should be vigilant, but the government has done *nothing* except suggest that car manufacturers stop putting so many distractions in the car. It’s time for them to legislate cars that read emails and update Facebook: these things CANNOT be used while in motion. GPS systems too. If you have to type the address in, do it before you leave or pull over. The manufacturers get away from liability by suggesting you don’t use it while driving before it turns on, but that’s not enforceable… now. We have the technology to prevent these injuries and deaths. But with most Americans behind the wheel and not walking or biking outside the car, there won’t be much action. I wouldn’t be surprised if distracted driving as a cause of crashes were under-reported. Drivers involved in a crash have every incentive to deny that they were distracted, and it is hard to prove otherwise (it depends on the type of distraction). (These stats may be a year out of line with one another, but they probably show similar trends.) So it actually doesn’t sound like things are getting worse out there. Obviously, at some point we’d like to see the fatality rate start to be outpaced by the increase in modeshare, but it doesn’t sound like there’s a reason to specifically blame an increase in distracted driving. It’s possible that there’s just more accurate reporting on distracted driving than there used to be. Was there any reason why this driver needed to cut me off this morning (no signaling either), no! http://www.youtube.com/watch?v=QxD3Ek6sDRo As I passed by he was on his phone so he had no idea I was next to him. Is it so much to ask to know your surroundings and stay off the phone while driving. Funny. I was about to use this article for a discussion on North Hollywood Patch about bike lanes on the very cross-street (Lankershim) you ride across. Seems to me the problem is that people are being aggressive and inattentive while operating dangerous heavy machinery. Yeah, I saw that same article at Patch but decided not to feed the troll. Ah, you’re better for it. I couldn’t help but pick the low hanging fruit. Thanks for subjecting me to the risk of injury or death so you can get that text out. Treat distracted driving as seriously as DUI’s. Repeat offenders go to jail. If there is a serious injury as possible felony charges if a death then negligent homicide. Additionally, there should be automatic license revocation and car seizure if there is an injury or death caused by distracted driving. Well done piece. It reflects how there is a ripple to tsunami effect when modern technology stones are arrogantly dropped into the ancient flowing river of travel. There are different currents for cars, bikes & pedestrians in the ever flowing river of travel. there is a basic overall problem with any and all of us not behaving in a cooperative manner , whether driving, walking, bicycling and so on the most important thing is for us to cooperate doing so and for some reason it doesn’t seem to be a priority as much as getting there first. Why is it important to pass another traveler just to get in line bunched up at a stop sign or light?Or for a car to pass a bicyclist when the bicyclist is going 45-50 mph downhill in what’s suppose to be a 30 mph zone The bicyclists are just as bad as the cars too. It’s like some weird ego thing. I have heard people go on about having the “right” the entitlement to do as they please regardless as to whether it’s the right thing to do, regardless as to the consequences. As a skateboarder I’m technically always breaking the law because it’s illegal to skateboard in SF so I’m always thinking I have to treat it as if I have no right of way or rights ever but especially with anyone weaker or less mobile than I , bigger or less maneuverable than I. When you are out on the bay in a boat there are rules about the right of way always. I’ve often thought these would make sense on land. a person rowing has the right of way over a person under sail . A person under sail has the right of way over a boat under engine power. But then in a shipping channel a large boat like a tanker or a freighter has the right of way over all smaller boats. There’s no way for a tanker to alter course to avoid colliding into a rowboat or sailboat. But in general the weaker always has the right of way. A person on foot has the right of way over a person on wheels. A person with out an engine has the right of way over one with a engine It’s about cooperation and all helmsmen have the obligation to avoid a collision at all costs. Just because you have the right of way doesn’t give you the right to use it to run over another person but many act these days as if it does. But in all these things there are always exceptions. Does a healthy young person out for a daily jog have the right of way over a little old lady in a wheelchair just because she has a motor and wheels? And so on. Regardless as to what our rights are we have no right to exercise them in doing wrong. We are not entitled to anything which may cause harm to another. I never understand the rush to get in line at a red light . the bicyclists are just as bad about this as the cars. The less you have to stop and start the easier your passage will be. When I am approaching an intersection and the light is red I slow down so I won’t have to stop and put my feet down when bicycling . If instead by slowing down I can get to the light a little later when it’s turned green then I don’t have to stop at all, (unless to keep from harming another) and I often end up passing all the other bicyclists who passed me to get there first. When I am skateboarding I find it even moreso.Cars and bikes will pass me two three intersections in a row just to get up to a line at a stop sign or light but inevitably I end passing them all and leaving them behind no matter how many times they may have rushed to get past me, most often speeding and often speeding to a ridiculous degree. If I am going 40 mph then to pas me they must go 40. Downhill on a bike you can do 40-50 easily that means a car could be going 50-60 miles an hour on side street in residential neighborhood which is just not right. I’m constantly amazed these days about this attitude of entitlement and having rights, as if because you have the right to do something makes it okay to do it under any circumstances. 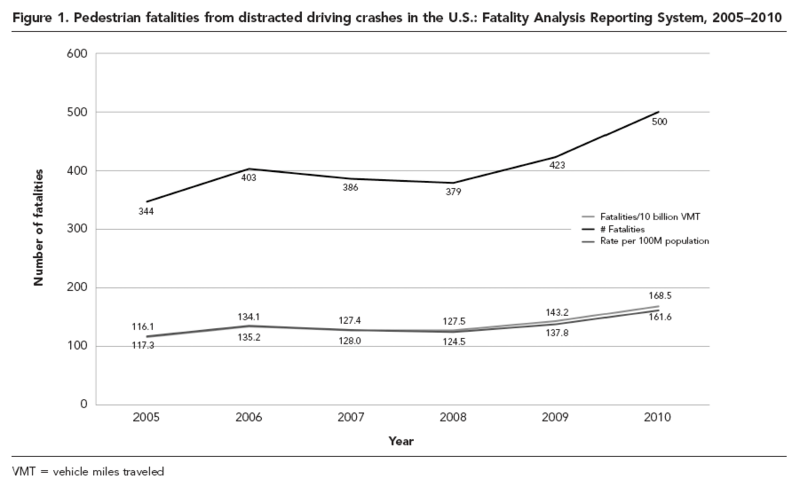 Why Are American Traffic Fatalities Rising So Quickly?